"...Caradhras rose before them, a mighty peak, tipped with snow like silver, but with sheer naked sides, dull red as if stained by blood." Called the Redhorn, one of the mightiest peaks in the Misty Mountains, beneath which lay the Redhorn Gate, the pass attempted by the Nine Walkers on the Quest of Mount Doom. If you thought this mountain's name was pronounced 'Caradras', you're in good company - even the BBC got this pronunciation wrong in their classic radio adaptation of The Lord of the Rings. The confusion arises because modern English uses the combination 'th' to refer to two different sounds: the 'voiceless' sound in 'both', and the 'voiced' sound in 'bother'. In Elvish, these two sounds were represented by different characters - typically thúle ( ) and anto ( ) respectively. Tolkien adopts a consistent transliteration scheme for these Elvish characters: he uses 'th' to refer exclusively to the voiceless sound, and 'dh' to the voiced. 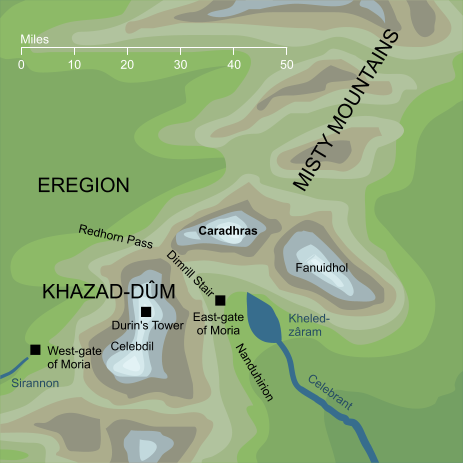 'Caradhras' is probably the most prominent use of this 'dh' sound, but it does occur fairly frequently in other names: Aredhel, Maedhros and Caras Galadhon are three important examples. Original content © copyright Mark Fisher 1997-2000, 2004. All rights reserved. For conditions of reuse, see the Site FAQ.